I've never been quite sure what to make of Mercury Rev. I don't think anyone has been. Maybe that's part of the appeal. I'm not even sure you can even call Mercury Rev a group. More of an anarchic audiophile collective movement. 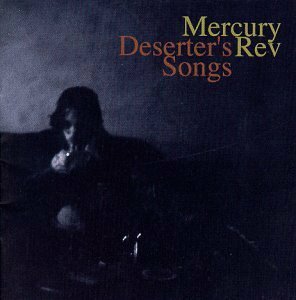 When talking about Mercury Rev, it's probably best to give people a touchstone, something even vaguely similar that people can latch onto. The best case scenario there is to talk about The Flaming Lips, which is to say, no help at all. In the case of both bands, each album is a singular moment unto itself, fairly unlike both whatever preceded it and whatever will follow it. I actually jumped onto Mercury Rev from the beginning, when their first album, "Yerself Is Steam," was re-released, after their original distributor, Rough Trade, collapsed in the US just weeks after its release. The song "Car Wash Hair" was a sort of hazy epic that I was looking for. It reminded me of a lot of the shoegaze stuff I was getting into at the time - My Bloody Valentine, Ride, Slowdive - but it also had an insanely catchy hook, something most of the shoegazers never needed. They also had a flute! It also warmed up slowly, blossomed into light and a ton of random sounds, and then baked in the fading daylight. I used to listen to the song a lot when I'd watch the sun go down in the summer. By the time their fourth album came around, the monumental "Deserter's Songs," in 1998, the band had gone through a bunch of changes, and a bevy of styles. They'd fired their original vocalist. The band's second album, "Boces," was similar to their first, but was getting more active. Their third album, "See You On The Other Side," was practically a full blown rock record, albeit with the flourishes the band was accustomed to. But I don't think anyone was quite ready for "Deserter's Songs." "Deserter's Songs" is a collection of songs that seem like they would most befit a cabin somewhere up in the mountains, coming from a radio that's just barely on the edge of reception, transmitted from some time in the deep past. It's full of things you don't normally hear that much of any more - falsetto operatic choir voices, theremins, pipe organs, woodwinds... and yet, it's still a very modern record. It was also supposed to be the band's swan song. They were going to put it out and then when it failed, they could walk away, knowing they had given it their last, best shot. And then, a funny thing happened. The album was a big hit. Oh, not here in the States, where it was an indie darling but didn't get that much airplay, but in the UK, NME magazine named it Album of the Year, and over there it spawned 3 Top 40 singles. Since then, Mercury Rev have mostly followed their own path, and the albums since then have been fascinating, a blend of new and old sounds, and it's always been impossible to predict. Their last album was six year ago, 2008's "Strange Attractors," but apparently they're back in the studio now, which means we should get more amazing music from them in the near future.